ACI HIPS high impact clear polystyrene plastic is a low cost, tough plastic material that is easy to thermoform and fabricate. 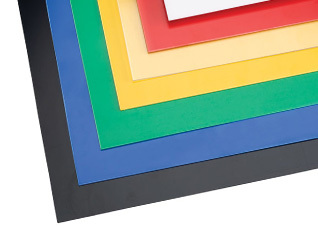 It is often used for retail display, countertop point-of-puchase (POP) displays, banners, and indoor signs. High impact polystyrene can be assembled with mechanical fasteners, solvents, or adhesives. Polystyrene is one of the most widely used kinds of plastic. Pure solid polystyrene is a colorless, hard plastic with limited flexibility. More than half of all polystyrene produced is blended with 5 to 10 percent polybutadiene to reduce brittleness and improve impact strength. This blend is marketed as high-impact polystyrene or HIPS for short. Several other copolymers are also used with styrene. Acrylonitrile butadiene styrene (or ABS plastic) is similar to HIPS: a copolymer of acrylonitrile and styrene, toughened with polybutadiene.